By now I’m sure you’ve heard all about the horrifying scandal involving Jerry Sandusky and the Penn State Football program. Former Athletic Director Tim Curley was arraigned for failing to make a report of suspected child abuse under Pennsylvania’s Child Protective Services Law. Legendary head coach Joe Paterno was not charged, but because Paterno never notified authorities about what he heard, a legitimate question remains if prosecutors could still technically charge him under this same statute. Let’s take a look at the statute itself and find out. (a) A person who, in the course of employment, occupation or practice of a profession, comes into contact with children shall report or cause a report to be made in accordance with section 6313 (relating to reporting procedure) when the person has reasonable cause to suspect, on the basis of medical, professional or other training and experience, that a child under the care, supervision, guidance or training of that person or of an agency, institution, organization or other entity with which that person is affiliated is a victim of child abuse, including child abuse by an individual who is not a perpetrator. Analysis: I think it’s pretty safe to say Joe Paterno is a person, although he apparently did not act like a very good one at any point during this entire ordeal. 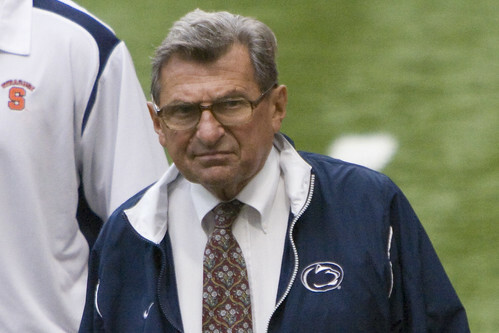 Paterno has been involved with the Penn State Football Camp for years. The camp website states: “Penn State’s Football Camps I and II are designed for students entering grades eight through 12 next fall. High school graduates are not eligible to enroll.” The standard “comes into contact” seems very low to me. It seems pretty clear Paterno meets this due to his continuous involvement with these camps. Question: Did Paterno have “reasonable cause to suspect” that a “child under the care of an organization with which he was affiliated” was a victim of child abuse? Analysis: I’m going to let the Grand Jury Report speak for itself on this one: “Joseph V. Paterno testified to receiving [McQueary’s] report (of abuse) at his home on a Saturday morning. Paterno testified that [McQueary] was very upset. Paterno called Tim Curley (“Curley”), Penn State Athletic Director and Paterno’s immediate superior, to his home the very next day, a Sunday, and reported to him that the graduate assistant had seen Jerry Sandusky in the Lasch Building showers fondling or doing something of a sexual nature to a young boy.” So ya, Paterno himself suspected that a child had been abused. (c) Whenever a person is required to report under subsection (b) in the capacity as a member of the staff of a medical or other public or private institution, school, facility or agency, that person shall immediately notify the person in charge of the institution, school, facility or agency or the designated agent of the person in charge. Upon notification, the person in charge or the designated agent, if any, shall assume the responsibility and have the legal obligation to report or cause a report to be made in accordance with section 6313. This chapter does not require more than one report from any such institution, school, facility or agency. Question: Assuming Paterno was required under subsection (b) to report what he heard, was his legal obligation absolved because of subsection (c)? Analysis: This subsection seems to be the key to alleviating Paterno from criminal liability. The Grand Jury Report states Paterno reported what he heard to his “immediate superior.” That very likely counts as telling a “designated agent” of the person in charge of his public institution. This means “the legal obligation” to report transferred to his superiors. I wonder which subsection will be updated next session?